On Friday 15th of December 2017, popular Ibadan hotelier and Ex-Theresians National President, Chief Mrs Omobolanle Morounranti Koiki (nee Oredein) had a grand burial for her grandmother, Chief Mrs. Florence Irebowale Oyekan Awoderu, the first Iya Ijo of Ijo St. Andrew's Anglican Church, Ogere Remo, Ogun State in Ogere. Mrs. Omobolanle Koiki is the first grandchild of the deceased. Her mother who is the first child of mama and her father passed on before mama , this explains why she played a huge role at the burial. City People OGUN Correspondent, BUNMI MUSTAPHA brings you gist from the burial. Deaconess Omolewa Ahmed, Kwara State 1st Lady came from Ilorin. She is a very close friend of Omobolanle Koiki , the deceased grand child and they have been friends since childhood. Dressed in her aso ebi with a simple style of iro and blouse with swarosky stones, she attended both the church service and reception. She came with Mrs.Joke Adeyemi, Mrs Akinleye , Mrs Ogunsola , Gbenga Ogunsola and they all spent quite sometime before leaving. The wife of Senator Ashafa, Mrs Folashade Ashafa also came with a large entourage. She has also been friends with Mrs Koiki for a long time , she came with a large entourage and they spent quality time. 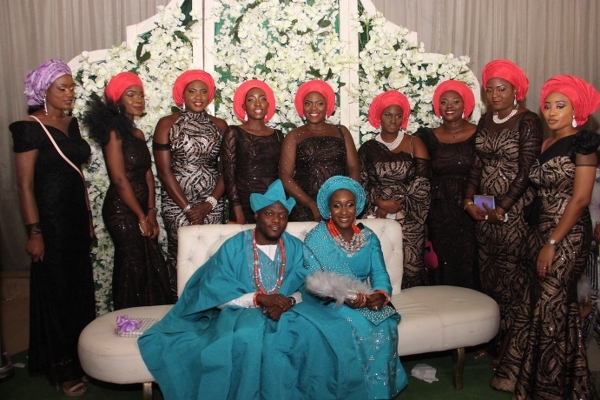 Toluwalope Allen is a family friend to the deceased's grandchildren, especially Kemi who is the immediate sister of Bolanle Koiki. This lady is very fashionable and stylish , she is a nurse and ahe came all the way from London for the burial. She came with another close friend, Mrs Bukola Gbami who is also a nurse here in Nigeria. St Theresa College Ibadan , ex-girls popularly called Ex Theresians were fully represented. Mrs Ranti Koiki is the National President of the Association. This explains why they trooped out from Abuja , Ibadan and Lagos chapter to support their leader. They were led by Lagos President, Princess Adeola Adeyemo and they all looked beautiful in their aso ebi. Hajia Ramat Abdulahi is the school daughter of Ranti Koiki when she was in the north. Hajia Ramat is one of the INEC big babes in Lagos. She was very supportive at the event. Mrs Abiola Olatunji, (Toto Abuga's late wife) also came with her entourage. She came with her friends all looking stylish in their gold outfits with bronze and peach aso oke all in coral beads. The Lagos society woman shared gifts among guests. Ibadan popular socialite, Femi Babalola was also among dignitaries who came for the burial. He came with few of his friends and they had a great time. Senator Joseph Olanrewaju Obembe was not also left out at the burial , he came with friends and family members. Amongst them are Tola Obembe , Kemi Obembe , Arch. Gbenga Akintola , Biola Owuade to mention a few. Pretty actress, Lepa Shandy came for the event . The actress who can pass for a model entered the venue quietly, but she looked gorgeous in her stylish aso ebi. Ogun popular juju maestro, Wole Papa was the official band of the day. The musician who is no doubt good at what he does kept guests on their feet all through with his melodious tunes. Chief(Mrs) Florence Irebowale Oyekan-Awoderu was born on the 18th of December 1919 unto the Obadipe family of Romidu compound, Ogere-Remo. Her parents were late Pa Osinuga Obadipe and late Madam Comfort Efupelubi Obadipe. Her surviving siblings are Madam Kokumo Adegbuyi and Pastor Idowu Osinuga an easy going gentleman. Mama was the first child in the family of seven children. 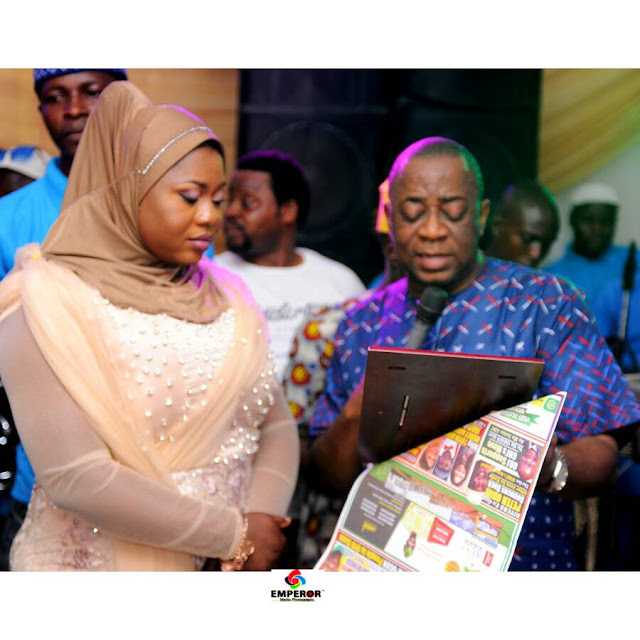 Her father was a successful business man, a farmer rearing thousands of pigs and also a native circumcision expert(Olukola) popularly known in Remo kingdom. Her mother was a trader, a peace loving woman and a devoted Christian. Mama attended Wesley School, Ogere-Remo. She was one of the best pupils in her class but unfortunately when her parents had their 3rd child, they withdrew mama from school to enable her assist her mother in nurturing her brother the only son of her mother Late Chief Olayinka Owolabi Obadipe popularly known as Ileke-idi. She started her business very early in life. She ventured into cooked ofada rice. She trained so many of those that sold Ofada rice in ogere like the popular Mama Titilayo and others. Mama later left the trade and opened a supermarket which became the best retail outlet in Ogere.Items such as imported set of dishes,grocery,pharmaceutical products, books, foodstuffs and variety of drinks were stocked up in mama's store. She got married to late Pa Moses Oyekabi Oyekan of the Agbejoye royal family in 1945.The marriage was blessed with 4 children before the demise of her husband.The first child of their marriage was the late Princess Winifred Mobolaji Oredein(Mama Ranti),the last wife of Late Chief S. T. Oredein, the Asiwaju of Ogere Remo and also the Principal organizing Secretary of the defunct Action Group. Next to her is Deaconess Margaret Olufunmilayo Osinoiki JP, a successful business woman married to the first lawyer and also the current Olori Omo-Oba in Ogere;Elder Isaac Adetunji Osinoki a steadfast christian;next to her is Late Mr. Kolawole Adeoye Oyekan and Evangelist Festus Olusegun Oyekan, a minister of God. She later got married to Pa. Eniola kiko Awoderu after the death of her first husband and the marriage was also blessed with four children. The first is Honourable Michael Abiodun Awoderu who is the Zonal Chairman of Ward B of the APC in Magodo and also the L.G.A Assistant organizing secretary of the APC in Ikosi-Isheri LCDA;followed by Gabriel Agbolahan, Olusola Adekoya and Folorunsho Eniola Awoderu-who are all successful businessmen based in Europe. Mama was a devoted Christian a member of Christ Anglican Church Ogere-Remo and also an active member of Ibukun Oluwa society. When St.Andrews church was planted very close to her house, she moved down to worship with them and she was one of the founding members of the church and also an active member of Irepodun Society. She was devoted, she loved working for God.She won several souls into the house of God and She was eventually installed as the first Iya Ijo of St. Andrews (Anglican) church. Chief Mrs Morounranti Omobolanle Koiki is the deceased's first grandchild . Mamas death means a lot to her. While growing up, she looked up to her because she was industrious and popular. Apart from that she was very close to her grandmother and would rather discuss intimate things with her than her mother who was her first child. When her dad died it was difficult for her mother but grandma made sure they were comfortable as much as she could afford. Again when her mother died she was devastated and didn't want to live Ogere again, but she was always visiting until she was moved to lagos where she passed on. Her grandmother died the same day as her father who died on the 13th of October exactly thirty one years ago.